GOG.com (formerly Good Old Games) is a digital distribution platform service for video games and films, operated by GOG Limited, a wholly owned subsidiary of CD Projekt based in Nicosia, Cyprus, with an office in Warsaw, Poland. GOG delivers video games through its DRM-free digital platform for Microsoft Windows, OS X and Linux. In March 2012, it began selling more recent titles such as Alan Wake, Assassin's Creed and the Metro Redux series, among many others. In 1994, Marcin Iwiński and Michał Kiciński founded CD Projekt. They originally imported games from wholesalers in America to sell in Poland. In late 2008, CD Projekt launched GOG.com under the moniker Good Old Games. The initial goal was to release classic games to a modern audience without digital rights management restrictions. During a period of days from September 19 to 22, 2010, the GOG.com website was disabled leaving behind messages on the web site and their Twitter accounts that the site had been closed. A spokesman for Good Old Games reiterated that the site is not being shut down, and confirmed news would be forthcoming about changes to the service. A clarification posted on the site on September 20, 2010, said they had to shut down the site temporarily "due to business and technical reasons", with industry journalists believing the shutdown may be related to the nature of DRM-free strategy, based on Twitter messages from the company. On September 22, 2010, GOG.com revealed that this shutdown was a marketing hoax as part of the site coming out of beta. The site's management, aware of the reactions to the fake closure, stated: "First of all we'd like to apologize to everyone who felt deceived or harmed in any way by the closedown of GOG.com. As a small company we don't have a huge marketing budget and this is why we could not miss a chance to generate some buzz around an event as big as launching a brand new version of our website and even more important, bringing back Baldur's Gate to life!" The site returned on September 23, 2010, with an improved storefront and additional benefits, as outlined during a webcast presentation. During the presentation, GOG.com's co-founder Marcin Iwinski and managing director Guillaume Rambourg had dressed as monks to atone for their sins. The relaunch of the site was considered by Rambourg to have been successful, having brought new customers that were previously unaware of GOG.com. As promised after its relaunch, GOG.com was able to offer several Black Isle Studios games such as Baldur's Gate, Planescape: Torment and Icewind Dale which have previously been unreleased through any download service due to legal issues between the ownership of Dungeons & Dragons-related games between Atari, Hasbro, and other companies. On March 27, 2012, Good Old Games announced that it was branching out to feature "AAA" and independent titles in addition to older games. The site was rebranded to GOG.com. In October 2012, GOG.com was announced to be bringing DRM-free games to OS X. This included the previously Steam exclusive (OS X version) The Witcher and The Witcher 2, both made by CD Projekt RED. GOG.com gathered user feedback in a community wishlist, and one of the most demanded feature requests was support for native Linux games, which gathered close to 15,000 votes before it was marked as "in progress". Originally GOG.com representatives said, that there are technical and operational issues which make it harder than it seems, however it's something they would love to do, and they have been looking at. On March 18, 2014, GOG.com officially announced that they would be adding support for Linux, initially targeting Ubuntu and Linux Mint in the fall of 2014. On July 25, 2014, Linux support was released early, and 50 games were released compatible with the operating system. Several of the launch titles included games that were newly compatible with Linux, while most of the games already supported downloads made for the operating system on other distribution platforms. On August 27, 2014 GOG.com announced the launch of the new addition to their service – distribution of DRM-free films. GOG.com offers DRM-free downloading in mp4 format and streaming of video in standard and DRM-free HTML fashion which doesn't bind users to any specific platforms or devices. The movies are made available in Full HD 1080p, 720p and 576p for limited bandwidth or download quotas; however, a few titles do not have the Full HD 1080p format available. GOG.com started with adding 21 documentaries about Internet culture and gaming. They also have plans for adding fiction films and series; according to GOG.com's managing director Guillaume Rambourg, they were in talks with many major studios. While studios' representatives liked the idea, they also were reluctant to let go of their current DRM approach until some other major studio would make the first step. Still GOG.com plan to work on overcoming the initial reluctance and moving DRM-free video forward. On December 9, 2013, GOG.com introduced a money-back guarantee for the first 30 days if a customer faces unresolvable technical problems with a bought game. Beginning April 2, 2015, GOG.com began to offer DRM-free downloads to holders of game keys from boxed copies of select games whose DRM validation systems no longer operate; examples are the S.T.A.L.K.E.R. series and the Master of Orion series. Over $800,000 of retail game purchases have been redeemed through this system until 2016. In the CD Projekt RED company update in June 2014, GOG.com announced that it would be bringing a Steam-like client, GOG Galaxy, to Windows, Mac, and Linux platforms. 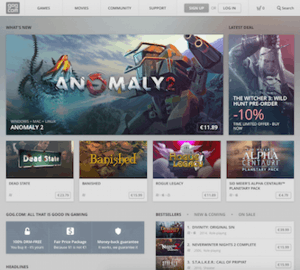 The client is designed as a storefront, software delivery, and social network client, allowing players to buy and play games from GOG.com and share them with friends. Galaxy is also going to include an original multiplayer API, allowing developers to include the same kind of multiplayer functionality in GOG.com versions of games as on Steam. The client is optional and will retain the DRM-free objective of the GOG.com website. On October 15, 2014 the open multiplayer beta of the GOG Galaxy client was started, accompanied by the giveaway of Alien vs Predator. In July 2015 the GOG Galaxy beta client was reviewed favorably by the PC Gamer magazine, especially noting the focus on user respect in comparison to a competing client. Revealed in June 2016, GOG Connect enables users with both GOG.com and Steam accounts to claim certain games they already own on Steam as part of their GOG.com library, allowing them to download the DRM-free version and other bonus items for that game offered by GOG.com. Not all such games are part of this offer, as it requires GOG.com to work with the game publishers to enable this. Further, the time to claim such games will be limited, though once a user has claimed their game on GOG.com, it otherwise remains in their library indefinitely. The offered digital goods (video games and movies) can be purchased and downloaded online and they are distributed without digital rights management. The prices of products typically range from about $5 to $10 for older games, along with special offers in sales held several times a week. Some newer titles have a higher price. GOG.com's digital products can also be given to other persons via redeemable gift certificates. The user does not have to install special client software to download or run the games, although a download manager, which is due to be phased out, and the GOG Galaxy client, which is currently in beta, are available. After downloading, the customer is free to use the software for any personal use like installing on multiple devices, archiving on any personal storage media for unlimited time, modding and patching; with the restriction that reselling and sharing is not permitted. The software installers are technically independent of the customer's GOG.com account, although still subject to GOG.com's EULA, where a "licensed, not sold" formulation is used. The "licensed, not sold" model frequently raises questions of ownership of digital goods. In the European Union, the European Court of Justice held that a copyright holder cannot oppose the resale of a digitally sold software, in accordance with the rule of copyright exhaustion on first sale as ownership is transferred, and questions therefore the "licensed, not sold" EULA. In order to ensure compatibility with newer versions of operating systems and current PC hardware, games are pre-patched and restored by GOG.com. This is achieved either by bundling such games with open-source emulation or compatibility software, such as ScummVM and DOSBox, or by source-code adaption. Additional compatibility fixes are included if required, sometimes coming from the game community itself (community-made patch). Examples of games which have such additional fixes are Outcast or Dungeon Keeper 2. Along with the games, customers are also able to download numerous extra materials relating to the game they purchased. Often these extras include the game's soundtrack (partly as FLAC), wallpapers, avatars, and manuals. GOG.com also offers full customer support for all purchases and a money-back guarantee for the first 30 days. Promotions are organized regularly. The style of these promotions varies from a discount for products that are bought in bundles, to thematic competitions like riddles, "guess a game from a picture" contests or "best time on a specific level". Also, GOG.com gives away promotion codes for a game with review contests. As GOG.com does not typically release absolute game selling numbers, market share considerations of GOG.com among the digital distributors are a challenge. But, sometimes an individual game developer releases their internal statistics about the selling performance on different game distribution channels for their specific game. In an article dated November 11, 2011, PC Gamer reported statistics for online sales of the The Witcher 2. According to PC Gamer, Direct2Drive, Impulse and Gamersgate's combined sales were a total of 10,000 (4%), GOG.com sold 40,000 copies (16%), while Steam sold in the same time period 200,000 copies (80%). On February 20, 2013, Defender's Quest developer Lars Doucet revealed the first three months of revenue following his game's release across 6 different digital distribution platforms, including 4 major digital game distributors and 2 methods of purchasing and downloading the game directly from the developer. The results showed that GOG.com generated 8.5% of the revenue – second only to Steam's 58.6% among the digital distribution platforms used. Doucet noted that "for the major [digital game distributors], GOG's star is clearly rising. Even under direct competition, GOG generated 14.5 percent as much revenue as Steam. [...] Steam enjoys a captive market of ardent loyalists, but GOG is swiftly becoming an attractive alternative and gaining loyalists of its own, especially in the anti-DRM crowd." As of June 9, 2015, GOG.com had seen 690,000 units of CD Projekt Red's game The Witcher 3: Wild Hunt redeemed through the service, more than the second largest digital seller Steam (approx. 580,000 units) and all other PC digital distribution services combined. On March 26, 2009, GOG.com announced it had signed a deal with Ubisoft to publish games from their back catalogue; this was the first deal with a major publisher to offer DRM-free downloads. The deal to publish through GOG.com also included games that were not available through any other online distribution channel. On September 5, 2014, GOG.com started to sell Amiga games from Cinemaware's catalogue, starting with Defender of the Crown. This was technically made possible through Cinemaware's own written emulator called "Rocklobster". On October 28, 2014, GOG.com was able to secure another major publisher as a DRM-free partner, Disney Interactive / LucasArts. With this new partnership, GOG.com began to re-release several often-requested game titles from LucasArts, starting with six titles (Star Wars: X-Wing, Star Wars: TIE Fighter, Sam & Max Hit the Road, The Secret of Monkey Island: Special Edition, Indiana Jones and the Fate of Atlantis and Star Wars: Knights of the Old Republic). On May 5, 2015, GOG.com released Pacific General and Fantasy General and named itself, GOG Ltd, as the publisher. The company revealed that it had acquired the copyright to these titles and that it intends to acquire more in the future. On August 26, 2015, Bethesda Softworks joined GOG.com with classical titles as id Software's Doom and Quake, Fallout (which had been sold on GOG by Interplay before the rights changed hands), and also some classic Elder Scrolls' titles. GOG.com has more than 1,800 DRM-free games in its catalogue and new ones are added several times a week. 1 2 Villasenor, Justin (July 10, 2008). "Good Old Games: Bringing classic PC games to an Internet near you". Destructoid. ModernMethod. Retrieved May 26, 2016. ↑ "GOG.com Site Overview". Alexa Internet. Retrieved April 1, 2015. ↑ "Shape your career with GOG.com". GOG.com. Retrieved January 20, 2014. ↑ Nunneley, Stephany (March 24, 2012). "GoG.com to become "bigger, fresher, newer" on March 27". VG24/7. Retrieved November 9, 2014. ↑ Vilches, Jose (October 19, 2012). "Good Old Games brings all-time classics to the Mac". TechSpot. Retrieved December 5, 2012. ↑ Purchese, Robert (May 17, 2015). "Seeing Red: The story of CD Projekt". Eurogamer. Gamer Network. Retrieved August 25, 2015. ↑ Makuch, Eddie (September 8, 2014). "GOG Celebrates Six Years of Advancing the "DRM-Free Movement"". GameSpot. CBS Interactive. Retrieved August 25, 2015. ↑ Good, Owen (September 19, 2010). "What's Happening With Good Old Games?". Kotaku. Retrieved September 19, 2010. ↑ Pereira, Chris (September 20, 2010). "Good Old Games Undergoing Changes But Not Shutting Down". 1UP.com. Retrieved September 20, 2010. ↑ Graft, Kris (September 20, 2010). "Reboot For DRM-Free PC Game Download Service GOG.com?". Gamasutra. Retrieved September 20, 2010. 1 2 Smith, Graham (September 22, 2010). "GOG hoax: "we could not miss a chance to generate some buzz"". PC Gamer. Retrieved September 22, 2010. ↑ Martin, Joe (September 22, 2010). "GOG relaunches, admits closure was a hoax". bitgamer.net. ↑ Walker, John (September 22, 2010). "Good Old Games Gets New, Relaunches". Rock Paper Shotgun. Retrieved September 22, 2010. ↑ Graft, Kris (September 22, 2010). "'Monks' Confirm Good Old Games PR Stunt, Site Relaunch". Gamasutra. Retrieved September 22, 2010. ↑ Graft, Kris (September 24, 2010). "In-Depth: GOG's Monk Fiasco And The Fight For Publicity". Gamasutra. Retrieved September 24, 2010. ↑ Graft, Kris (December 19, 2009). "Hasbro Files Suit Against Atari Over Dungeons & Dragons Deal". Gamasutra. Retrieved September 28, 2010. ↑ Purchase, Robert (September 28, 2010). "Planescape: Torment re-released at last". Eurogamer. Retrieved September 28, 2010. ↑ "Bigger. Fresher. Newer. See what's new on GOG.com". GOG.com. March 27, 2012. Retrieved April 5, 2012. ↑ "Add Linux versions of games - GOG.com". March 2012. ↑ "GOG.com (Good Old Games): No Linux For You!". October 16, 2012. ↑ "GOG.com on Windows 8, Mac gaming, and Linux support". October 24, 2012. ↑ "GOG.com Soon On More Platforms". March 18, 2014. ↑ "GOG.com Now Supports Linux!". July 25, 2014. ↑ "Introducing GOG.com DRM-Free Movies". August 27, 2014. ↑ "GOG.com forum: Cause there's no business like show-business!". September 1, 2014. 1 2 Griffiths, Daniel Nye (December 9, 2013). "Good Guy GOG? Online Games Merchant Offers Money-Back Guarantee". Forbes. Retrieved December 29, 2013. ↑ Clint Smith (April 3, 2015). "GOG Announces New DRM-Free Reclamation Service". techraptor.net. Retrieved April 8, 2015. ↑ "Reclaim Your Games". GOG.com. Retrieved April 24, 2016. ↑ Farokhmanesh, Megan (June 5, 2014). "GOG Galaxy promises no online activation needed for gaming". Polygon. Retrieved June 6, 2014. ↑ Prescott, Shaun (October 15, 2014). "Alien versus Predator Classic is free on GOG this week". PC Games. Retrieved November 9, 2014. ↑ Davenport, James (July 14, 2015). "GOG Galaxy is a necessary break from Steam's feature creep". PC Gamer. Retrieved July 15, 2015. ↑ Craddock, David (June 1, 2016). "GOG Connect lets you add Steam games to your GOG library for free". Shacknews. Retrieved June 1, 2016. ↑ Caron, Frank (September 25, 2008). "Good Old Games and the 'idiocy' of DRM". Ars Technica. Retrieved September 27, 2008. ↑ Caron, Frank (September 9, 2008). "First look: GOG revives classic PC games for download age". Ars Technica. Retrieved September 27, 2008. ↑ "GOG Galaxy FAQ". Retrieved May 14, 2015. ↑ "GOG.com FAQ". GOG.com. December 27, 2014. Retrieved December 27, 2014. ↑ Walker, John (February 1, 2012). "Thought: Do We Own Our Steam Games?". Rock, Paper, Shotgun. Retrieved December 27, 2014. ↑ hg/mz (AFP, dpa) (July 3, 2012). "Oracle loses court fight over software resale rules". dw.de. Retrieved December 30, 2014. ↑ Voakes, Greg (July 3, 2012). "European Courts Rule In Favor Of Consumers Reselling Downloaded Games". forbes.com. Retrieved December 30, 2014. ↑ "JUDGMENT OF THE COURT (Grand Chamber)". InfoCuria – Case-law of the Court of Justice. July 3, 2012. Retrieved December 30, 2014. ↑ Timothy B. Lee (July 3, 2012). "Top EU court upholds right to resell downloaded software". Ars Technica. ↑ Bennet, Tom (September 16, 2015). "How GOG.com Save And Restore Classic Videogames". rockpapershotgun.com. Retrieved January 22, 2016. ↑ Hall, Charlie (July 14, 2014). "Nostalgia is a powerful drug: How GoG.com is growing beyond a back catalog". Polygon.com. Retrieved July 24, 2014. ↑ terence_13 (February 14, 2010). "Outcast Shamazaar-MUD+Twon-Ha patch inside". www.planet-adelpha.net. Archived from the original on August 25, 2010. Retrieved September 8, 2013. ↑ "Outcast 1 available on GOG.com! | Outcast". open Outcast. April 21, 2010. Retrieved May 7, 2012. ↑ _Zenger_ (August 8, 2010). "EXPERIMENTAL OUTCAST HI-RES PATCH, UP TO 1280x768 + CYANA LIGHTHOUSE PROBLEM FIXED". GOG.com. Retrieved September 8, 2013. ↑ GOG.com team (July 4, 2012). "Dungeon Keeper 2 Hardware Acceleration Fix is now LIVE!". GOG.com. Retrieved September 8, 2013. ↑ Devore, Jordan (January 31, 2014). "How nice: GOG.com adds 31 FLAC soundtracks". Destructoid. Retrieved June 17, 2014. 1 2 3 4 Hill, Owen (November 30, 2011). "GOG release The Witcher 2 sales stats. Steam dominates all competitors combined". PC Gamer. Retrieved April 4, 2014. ↑ Doucet, Lars (February 20, 2013). "Defender's Quest: By the Numbers, Part 2". Gamasutra. ↑ "News: GOG Galaxy home to over half of The Witcher 3: Wild Hunt PC gamers". GOG.com. June 12, 2015. Retrieved June 12, 2015. ↑ "The Witcher 3: Wild Hunt". Steam Spy. June 11, 2015. Retrieved June 11, 2015. ↑ Newhouse, Alex (June 11, 2015). "More People Playing Witcher 3 on GOG than on Steam – CD Projekt's digital distribution service edges out Steam and all other PC platforms.". GameSpot. Retrieved June 11, 2015. ↑ Games Press (September 5, 2014). "Cinemaware announces one-of-a-kind Amiga & PC distribution agreement with GOG.com". mcvuk.com. Retrieved November 9, 2014. ↑ "Defender of the Crown – One of Cinemaware's greatest games is now on GOG!". indieretronews.com. September 5, 2014. Retrieved November 9, 2014. ↑ O'Connor, Alice (October 28, 2014). "Sam & Max & X-Wing & TIE Fighter: GOG Get LucasArts". Rock, Paper, Shotgun. Retrieved November 9, 2014. ↑ Kuchera, Ben (October 28, 2014). "Disney and GoG re-release classic Lucasfilm games, X-Wing was just the beginning". polygon.com. Retrieved November 9, 2014. ↑ "New Publisher: Disney Interactive / Lucasfilm". GOG.com. October 28, 2014. Retrieved November 9, 2014. ↑ "Release: Pacific General + Fantasy General". GOG.com. May 5, 2015. Retrieved May 5, 2015. ↑ "GOG.com staff posts regarding the acquisition of copyright". GOG.com. May 5, 2015. Retrieved May 5, 2015. ↑ Orland, Kyle (August 26, 2015). "PSA: Classic Bethesda titles available DRM-free on GOG – Older Doom, Fallout, and Elder Scrolls bundled with discounts this week.". Ars Technica. Retrieved August 27, 2015. ↑ "Games Catalogue". GOG.com. Retrieved December 2, 2016.